The corresponding or submitting author submits the paper to the journal. This is usually via an online system. Occasionally, the journal may accept submissions by email. The staff at Editorial Office checks the paper’s composition and arrangement against the journal’s Author Guidelines to make sure that it includes the required sections and stylizations. The quality of the paper is not assessed at this point, but similarity check is performed to detect any possible plagiarism or redundant submission. The editor(s) checks that the paper is appropriate for the journal and is sufficiently original and interesting. If not, the paper may be rejected without being reviewed any further. The journal has Associate Editors and section editors who handle the peer review. They are assigned at this stage. The handling editor sends invitations to individuals he or she believes would be appropriate reviewers. As responses are received, further invitations are issued, if necessary, until the required number of acceptances is obtained – commonly this is 2, but may vary depending upon the submission type. The reviewer sets time aside to read the paper several times. The first read is used to form an initial impression of the work. If major problems are found at this stage, the reviewer may feel comfortable rejecting the paper without further work. Otherwise they will read the paper several more times, taking notes so as to build a detailed point-by-point review. The review is then submitted to the journal, with a recommendation to accept or reject it – or else with a request for revision (usually flagged as either major or minor) before it is reconsidered. The handling editor considers all the returned reviews before making an overall decision. If the reviews differ widely, the editor may invite an additional reviewer so as to get an extra opinion before making a decision. The editor (or Editorial Office) sends a decision email to the author including any relevant reviewer comments. These comments are anonymous as the journal follows a double-blind peer review policy. If accepted, the paper is sent to production. If the article is rejected or sent back for either major or minor revision, the handling editor includes constructive comments from the reviewers to help the author improve the article. At this point, reviewers may also be sent an email or letter letting them know the outcome of their review. If the paper was sent back for revision, the reviewers should expect to receive a new version, unless they have opted out of further participation. However, where only minor changes were requested this follow-up review might be done by the handling editor. The articles in Biological Research & Reviews are open access articles licensed under the terms of the Creative Commons Attribution Non-Commercial License (http://creativecommons.org/licenses/by-nc-sa/3.0/) which permits unrestricted, non-commercial use, distribution and reproduction in any medium, provided the work is properly cited. Copyright © 2019 Biological Research & Reviews All Rights Reserved. Subject to change without notice from or liability to Biological Research & Reviews. 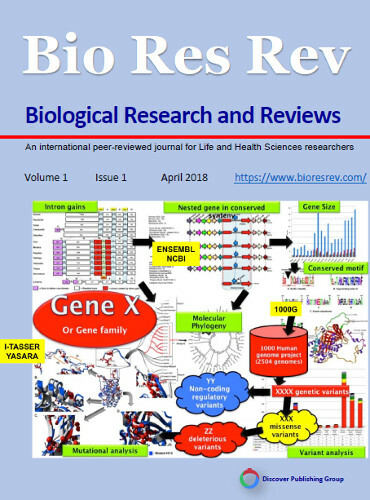 Biological Research and Reviews (BioResRev) is published by Discover STM Publishers.